1. Which licences must I have to charter a vessel? You must have the valid skipper licence and VHF radio licence. You do not have to hire a professional skipper if you have all necessary licences and sailing experience but if you still want a skipper we will gladly recommended one. You pay for the skipper as well as his meals, whether you prepare them on board or go to the restaurant. 3. Are the vessel and the crew insured? Yes, all vessels and crews are insured against the possible damages. 4. Is it possible to charter a vessel for just a few days? Mostly the yachts are chartered for a seven-day period, from Saturday until Saturday but it is also possible to rent a vessel for a few days and the largest choice of the available vessels is in the preseason and postseason period. In this case, please, inform us on children’s age to ensure the appropriate sizes of lifejackets for them. If you take the voyage with smaller children, we recommend ordering the safety net. You need to take only your clothes and medicines. For colder weather, bring warmer clothes and waterproofed jackets. Towels you can order on our reception according to the price list of Asta Yachting. 7. Where can we park a car in the marina? The marina has sufficient parking spaces which are monitored 24 hours a day. The price is 80 KN per day (cca. 10 € per day). 8. Where can I buy groceries to take on board? Groceries can be bought in our marina or larger supermarkets near Marina Dalmacija or on www.jamyachtsupply.com. 9. May I take pets on board? Yes, pets are allowed on bord. Price according to the pricelist of Asta Yachting. 10. 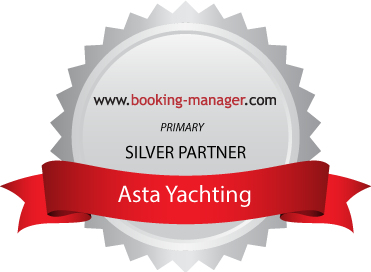 Do you organize transfers from the airport to the Asta Yachting base? Yes, upon your request, we organize transfers from the airports to our base in Sukošan. For any further information, please contact our reservation office.